We need your help to pedal a revolution! As we return to Afghanistan to continue our work with the Afghan National Women’s Cycling Team we are looking to raise the funds we need to pull off the trip by crowdsourcing Kickstarter style. Our work over the past 5 years has always depended upon the generosity of the average person, donating small and large amounts to support the work we do and follow along on the journey as it unfolds. In two weeks we leave, and we are looking to rally the masses to support the upcoming trip. We have two weeks to raise $5,000 and we need everyone’s help, whatever that looks like to you. Last spring we delivered our first round of gear for the mens and women’s national teams and started production on the film, Afghan Cycles with Let Media. Afghan Cycles documents the story of the Afghan women that dare to ride which will premiere in 2014 at film festivals around the world. You can see a glimpse of the that trip and our first steps with the team, which we will be continuing this trip. Unfamiliar with the work we do, and why we do it? Check out the TEDx talk by our founder, and National Geographic Adventurer of the Year, Shannon Galpin about the bike as a vehicle of social change and how we are pedaling a two-wheeled revolution. It truly takes a village – and we are grateful to everyone that has continued to support the work we do, and to those of you that are just joining us, we look forward to bringing you along on the journey ahead as we continue our next steps with your help! A revolution doesn’t happen in a bubble, it takes hundreds of people willing to step up and join the movement! Please join us to keep us rolling forward! You can ensure the success of this upcoming trip by supporting our work and the women that dare to ride by donating today!! We’ll update on Facebook daily as we get closer to reaching our goals! It has been our biggest honor to work with the women and girls in Afghanistan, and it wouldn’t have been possible without individuals donating in belief that change is possible and that women around the world deserve a voice. Thank you. 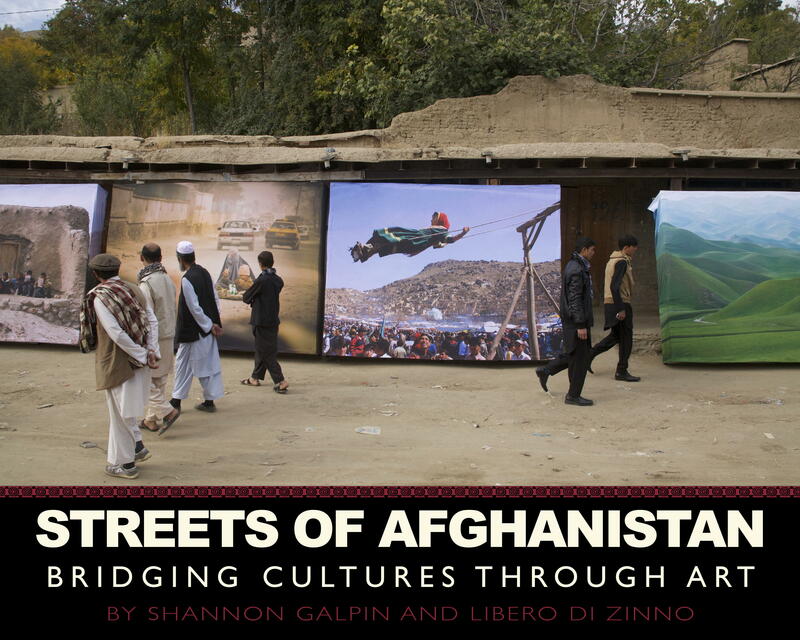 We are so proud to share the launch of the Streets of Afghanistan coffee table book from Hatherleigh Press. The book is available for pre-order now and hits bookstores October 29th. This books documents the Streets of Afghanistan exhibition from inception in Kabul in October 2008, where we met the Afghan photographers at AINA Photo who became part of this exhibit. To its journey to the series of public exhibitions in the streets and villages of Afghanistan last fall. Photographer Tony Di ZInno was with us on both the initial trip in 2008 and 4 years later for the public exhibitions in 2012, beautifully documenting the process and the exhibitions. My heartfelt gratitude goes out to the photographers involved in this project, from the five photographers I met on my first visit to Afghanistan at AINA Photo Agency, Travis Beard, Wakil Kohsar, Najibullah Mustafer, Gulbidden Elham, and Mariam Alimi. To the international talents of Beth Wald, Paula Bronstein, and the late Paula Lerner. To the addition of two images by NBC’s Ann Curry who we met in the spring Kabul in 2009 . And, last but not least a huge bear hug to the man that joined us in 2008 and returned in 2012 to document the exhibition he was then a part of, Tony Di Zinno. 10 photographers, from 3 countries. Its been the biggest honor to share these images taken in Afghanistan with Afghans in their streets. The power of photography and voice has been part of Mountain2Mountain since its inception in 2006 with our very first event with photographers Beth Wald to set the backdrop of our fundraiser, to our first photography exhibition in support of a project in Nepal, Views of the Himalaya, to the first iteration of the Streets of Exhibition in a small scale studio show after our 2008 visit, Dreams of Kabul. Time and time again, we have integrated photography into our outreach and our mission to inspire, create conversation, and challenge stereotypes in an effort to connect communities and cultures. We hope you will be inspired by this book, and believe that public art is an integral part of communities, and more of it is needed in countries like Afghanistan. We hope you will add this book to your collection, and give as gifts of inspiration, and know that you were part of the journey. Many thanks to you for your support, for your encouragement, and for continuing to follow the journey through our blogs and photos.